In this second week of Eastertide, we spend time with the Gospels of the Easter Octave, the eight days comprising the celebration of Easter. On day five, Easter Thursday, we hear Luke’s account of what takes place when the Emmaus disciples return to Jerusalem. Once again, when we reflect on a few details, the story becomes vital to our understanding the mystery and miracle of Easter. First, we choose a translation that speaks to us most clearly. Then we reflect. If we want to hear an audio version of today’s verses, visit the USCCB site. We may find other versions by using the scripture link and drop-down menus. In the MESSAGE translation, Cleopas and his companion went over everything that happened on the road and how they recognized him when he broke the bread. Can we imagine ourselves listening to our colleagues as they tell us that they have witnessed a miracle? Can we envision our conversation with family and friends as we hear about their incredible interaction with the risen Christ? While they were saying all this, Jesus appeared to them and said, “Peace be with you.” They thought they were seeing a ghost and were scared half to death. Can we predict our reaction to the appearance of Christ among us? What do we say when we share a meal with him? Is our overwhelming emotion fear? Do suspicion and doubt take over? Do anxiety and disbelief crowd our hearts? And then we hear Jesus’ words. They still couldn’t believe what they were seeing. It was too much; it seemed too good to be true. We are startled to hear the Teacher ask: “Do you have any food here?” They gave him a piece of leftover fish they had cooked. He took it and ate it right before their eyes. If we persist in a thick-headed and slow-hearted reaction, we look for ways to unravel the fraud we suspect. If we are reluctant and discouraged, we listen and watch warily, looking for reasons to doubt. If we remain hopeful and determined, we open our minds and hearts as we prepare to love and be loved. We listen to Christ’s words. We accept the joyful newness that asks to change our thinking. Jesus says, “Everything I told you while I was with you comes to this: All the things written about me in the Law of Moses, in the Prophets, and in the Psalms have to be fulfilled. You’re the first to hear and see it. You’re the witnesses”. We cannot do this, we are thinking. We do not have the courage or the tools. This newness is all too new, and too incredible for belief. Until Christ tells us . . . “What comes next is very important: I am sending what my Father promised to you, so stay here in the city until he arrives, until you’re equipped with power from on high”. Christ predicts the arrival and in-dwelling of the Holy Spirit. Christ offers a gift too amazing to believe. Christ proposes a life too wonderful, too mystifying, too marvelous to believe. And yet . . .
Christ stands in the midst of us, sharing our meals, attending to our fears and doubts. Christ has fulfilled the promise of redemption made by the Living God for millennia. The choice is ours to make. Do we turn inward in our doubt? Or do we open in newness to accept the fulfillment of the promise we are offered? For other posts on the story of Emmaus, enter the word into the blog search bar and explore. In this second week of Eastertide, we spend time with the Gospels of the Easter Octave, the eight days comprising the celebration of Easter. On day four, Easter Wednesday, we again hear Luke’s story of the road to Emmaus. Today we look again at a few details that bring this story into the present. First, we choose a translation that speaks to us most clearly. Then we reflect. If we want to hear an audio version of today’s verses, visit the USCCB site. We may find other versions by using the scripture link and drop-down menus. In the MESSAGE translation, the story of Cleopas and his companion, and their astounding encounter with the risen Christ, carries the subtitle A Ghost Doesn’t Have Muscle and Bone. We want to remember this today as we face a world that is eager to distract us for the message we need to hear. They were deep in conversation, going over all these things that had happened. We can imagine ourselves moving through our day, walking side-by-side with friends and family, hashing out surprising events that have stunned our community. Too often we are so fully involved in our own story, we do not notice the stories of others. They were not able to recognize who [Jesus] was. We can see ourselves as lovers of Christ and believers in his promise; yet we are not always able to see the truth that stands before us. We are thick-headed and slow-hearted, reluctant and discouraged; yet we remain hopeful and determined, prepared to be loved. We are ready for the newness despite the lateness of the hour. We invite the prophets among us to share their experience of God. We remain open to the Holy Spirit and the gift of new and intense joy. And here is what happened: He sat down at the table with them. Taking the bread, he blessed and broke and gave it to them. At that moment, open-eyed, wide-eyed, they recognized him. This is how we must go into the world each day, open-eyed and wide-eyed. We must be willing to be amazed. We must be open to the promise. We must be ready to meet the Christ when we are downcast and least expecting to believe that this fact is true . . . A Ghost Doesn’t Have Muscle and Bone. The eleven huddle in fear for their lives when the Emmaus disciples burst into the room telling of their resurrection experience with Jesus. We can imagine the juxtaposition of the Emmaus joy and the Calgary fear . . . these disciples are living two different aftermath experiences . . . and then Jesus appears to affirm the truth: that what they have hoped for has come to fulfillment . . . he is risen! Then the disciples hear the true call of the aftermath. This call is not that troubles will fall away from Christ’s workers . . . but rather that these workers will bring the same hope to others that Jesus has brought to them. The light has come to the world in fullness just as they had expected. And so it also with us. The aftermath that Jesus foretells is already surrounding us. Perhaps we just cannot see this duality yet that the light has come to the world in fullness just as we have expected. Several times a year we visit the ending of Luke’s Gospel during our Noontime reflections. Perhaps we need this aftermath reminder that often. Just a few weeks ago we spent some time thinking about the Emmaus people on the road with Christ. Today we see them harbinger the news to the eleven that the Christ has risen. The light has come to the world in fullness just as they had expected. We seem to always need reminding that the paradox of the Easter story is that we are free even though we do not always feel free; yet the very act of our doubt becomes an act of faith because the light has come to the world in fullness just as we have expected. We seem to always need reminding that the hope of Easter is fulfilled in us; we bring that message to one another on dark days because the light has come to the world in fullness just as we have expected. We seem to always need reminding that the love of Christ sustains us in all we do and think and say; we offer ourselves as victims each day in his love because the light has come to the world in fullness just as we have expected. We are Easter People, yearning for the goodness of life and perfection in God; and we live that goodness and perfection because the light has come to the world in fullness just as we have expected. Is this the aftermath we have expected from the Easter story? Yes it is, because the light has come to the world in fullness just as we have expected. A favorite from April 28, 2009. 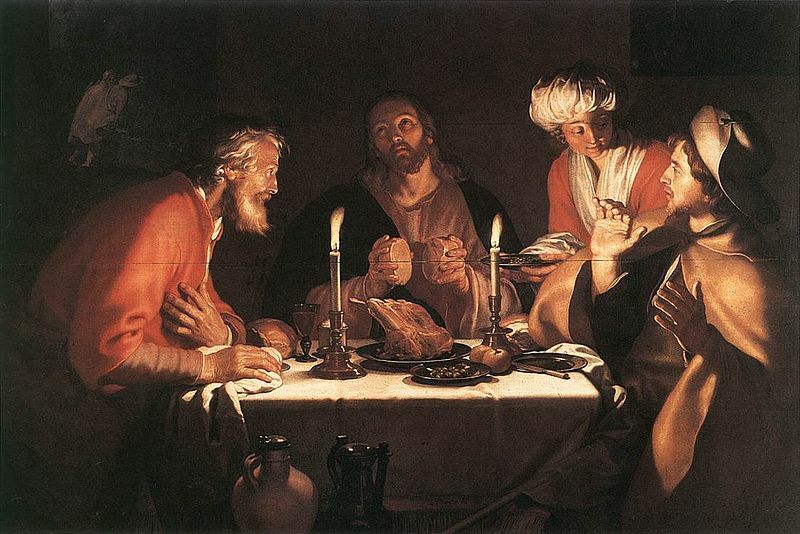 For more reflections on this special encounter with Christ, enter the word Emmaus into the blog search bar. The New Testament brings us the good news of personal freedom and the reality of our individual relationship with God. Joy continues to surprise us as we rejoice in the coming of the Messiah. Luke’s Infancy Narrative (Luke 1-2) is likely well-known to us. It is also likely that the story of the disciples who meet Christ on the road to Emmaus (Luke 24:13-25) is also a familiar one. When we read these two stories side by side we understand that Christ’s joy defeats all sadness, bridges all gaps, heals all wounds, brings light to all darkness, and is always present in our lives. When we find ourselves in circumstances that offer every reason to doubt the power of God’s joy, we might turn to these verses to remind ourselves that with God all things are possible, with God there is always hope in the midst of despair, with God there is always a reason to celebrate. Today we look at more verses that cause fundamentalists to calculate the exact date of the ending of life as we know it for all. Today we have an opportunity to grow in our knowledge of God. 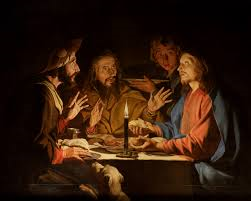 Today scripture is opened for us just as Jesus opened scripture for the disciples who journey to Emmaus. As we continue in our Easter pilgrimage, let us pause for a moment to consider Mark’s record of Jesus’ words. God says: If you know me than you know that I do not wreak havoc upon the earth. If you know me you understand that I am both patient and persistent. If you know me you know that I am with you always and that I am willing to wait an eternity for you to turn to me . . . but turn you must. Do not be afraid to come to me. Be open to my invitation to be one in me. Do not fret about the details of your life but be open to my plan for you. It is a plan of wonder not of woe; it is a plan of love and this love has already come upon you. Do you wait and watch for a distant coming? I am already among you. You only need open your eyes and ears and hearts . . . and you will know. When we find that we begin to fuss over the detail of who numbers in the elect and who will be left behind we can be certain that we have focused our energies incorrectly. When we make room for others at the table, when we forgive those who harm us, when we ask intercession for our enemies . . . then we know that we understand that the coming is already upon us. Easter is an eight day celebration beginning on Easter Sunday, running through the Easter Octave and ending on the Second Sunday of Easter. This tradition reflects the joy the early apostles felt as they experienced the new presence of the Risen Christ. Jesus offers us this same experience today. Wishing all those who follow the Noontimes a graced and peace-filled Easter Saturday. If we want to acknowledge the gift of God’s presence in our lives, let us first give thanks. If we want to fully participate in the resurrection journey, let us first give thanks. If we want the full impact of our own Emmaus experience, let us first give thanks. If we want to share in God’s Easter hope, let us first give thanks. If we want to share in God’s Easter joy, let us first give thanks. And as we give thanks . . . let each of us become witnesses to the story we know to be true. The story of God’s great love for all of creation, the story of God’s plan for the salvation of the world. Easter is an eight day celebration beginning on Easter Sunday, running through the Easter Octave and ending on the Second Sunday of Easter. This tradition reflects the joy the early apostles felt as they experienced the new presence of the Risen Christ. Jesus offers us this same experience today. Wishing all those who follow the Noontimes a graced and peace-filled Easter Friday. God is so infinitely good to give us multiple opportunities to see the full measure of the promise held out to us. Jesus is the patient brother who journeys with us even when we cannot see him. The Spirit never abandons her hope for us who live in a world that rejects her consolation and compassion. The goodness of God’s plan brings us many Emmaus experiences in our resurrection journey. Let us ready our ears and open our eyes. Let us admit to our own slowness of heart in accepting what stands before us. Let us put down roots in the word that has been planted within. Let us be glad in the miracle of Easter, and share the good news that Christ is risen in each of us today.